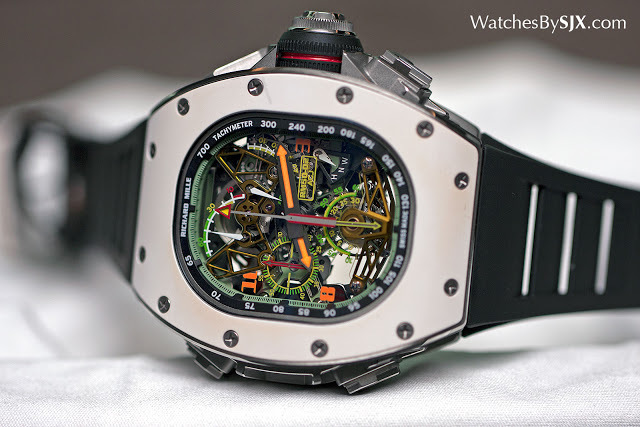 Richard Mille always manages to surprise each year, and so it did at SIHH 2016. While other watchmakers are squirming amidst slowing demand, Richard Mille is sailing through being the ultimate horological status symbol. Or more specifically, soaring past, with the flagship new wristwatch being the RM 50-02 ACJ Tourbillon Split Seconds Chronograph, designed in collaboration with Airbus Corporate Jets. And Richard Mille also debuted its first fountain pen, made of carbon composite and featuring a mechanical retraction mechanism. But let’s start with the most basic watch introduced at SIHH, the RM 67-01 Automatic Extra Flat, the brand’s first extra-thin wristwatch in its signature tonneau shape (its earlier slim watches were either rectangular or round). 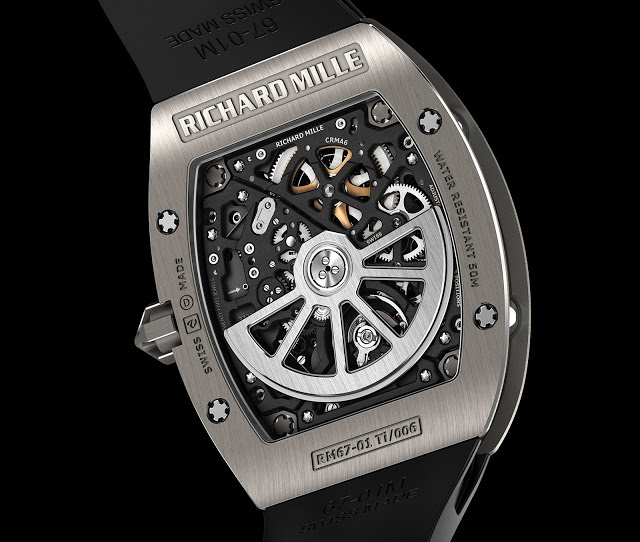 Equipped with a newly development movement, the titanium RM 67-01 becomes one of Richard Mille’s entry-level watches, with a retail price of SFr89,700. The case is just 7.75 mm high, putting it in the same league as slim automatic watches from the likes of Jaeger-LeCoultre and Piaget, which are well regarded for their thin movements. Although it is thin, the RM 67-01 is nonetheless 38.7 mm in diameter and just over 47 mm long, giving it a footprint almost as large as that of the bestselling RM 10. 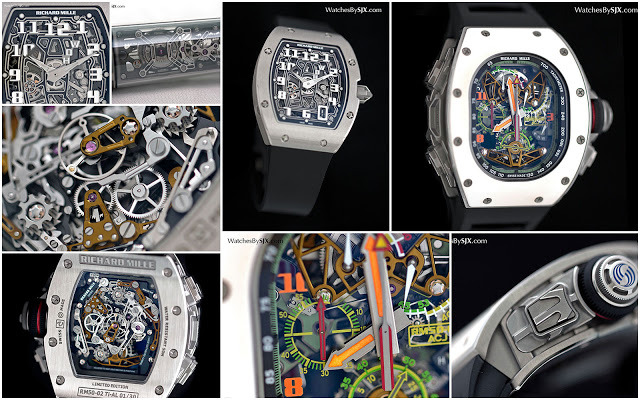 Inside is the CRMA6, a new calibre developed in-house by Richard Mille (as opposed to the Vaucher movements used in most of its other automatic watches). 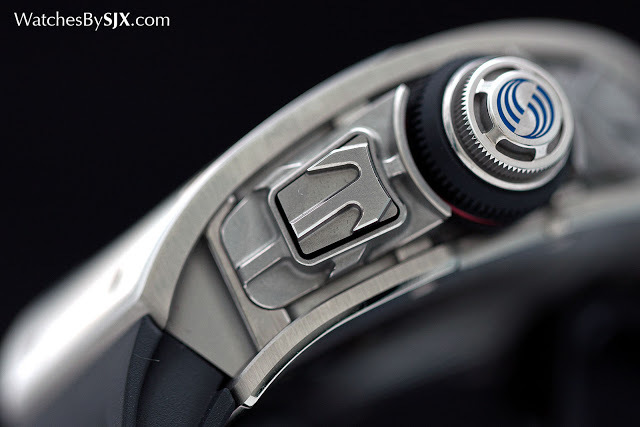 It has a full rotor made of platinum, as well as a 50 hour power reserve. 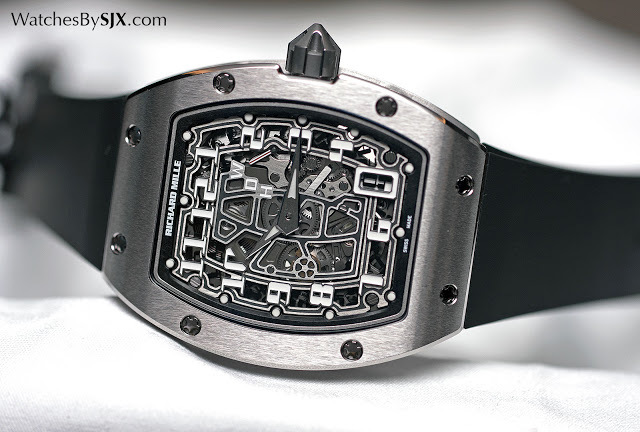 Typically for a Richard Mille watch, the bridges are finished with a matte black coating. 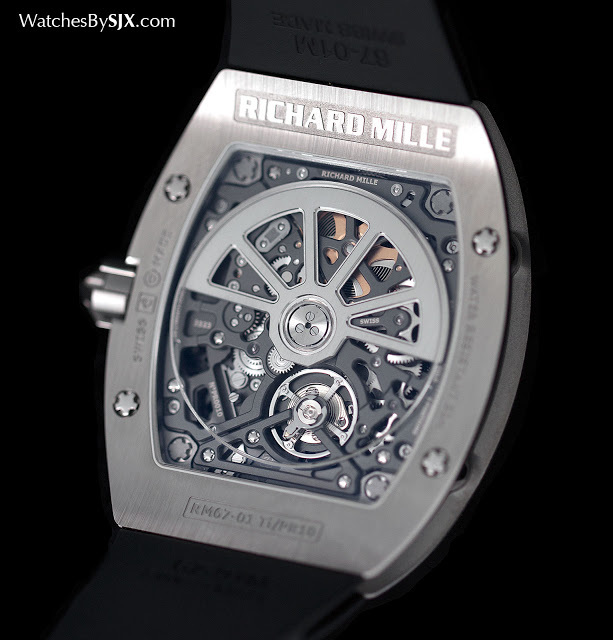 The dial is open, featuring the look found in most Richard Mille watches, but instead of being printed on a sapphire dial, the numerals are mounted on twin rails that circle the face. A crown function indicator sits discreetly at two o’clock, with a tiny hand that points to the position the crown is in: “H” for hands, “D” for date, and “W” for winding. With the basics out of the way, it’s the turn of the RM 50-02 ACJ Tourbillon Split Seconds Chronograph. This is the result of a partnership with Airbus Corporate Jets (ACJ), the division of the European plane maker that specialises in turning its commercial jets into flying palaces – the mode of transportation favoured by many Richard Mille clients. 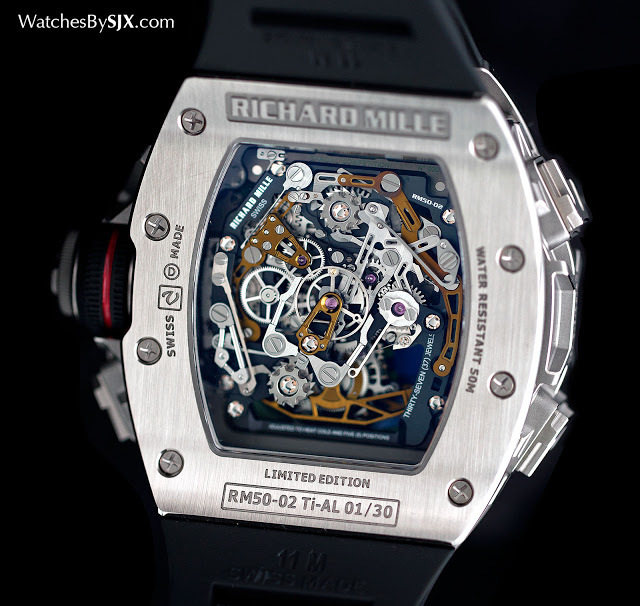 The look of the RM 50-02 is the result of a collaboration between ACJ’s chief designer and Richard Mille. Made of a light titanium-aluminium alloy, the RM 50-02 case retains the brand’s usual tonneau shape, there are various elements inspired by Airbus aircraft scattered throughout the watch. For the first time the case is held together by Torq Set screws, a high-end screw used in Airbus planes and also military jets. The oval dial, for instance, is modelled on the shape of the windows inside Airbus planes. 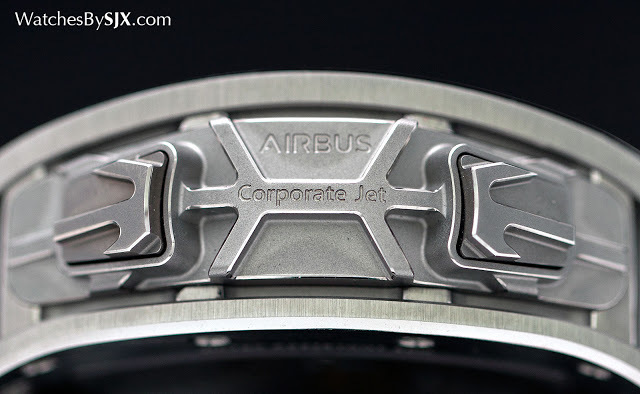 And the jet turbine-shaped brown is engraved with the Airbus logo. Visually the watch is a riot of colour and complexity, with the white insert around the dial made of scratch resistant ceramic. 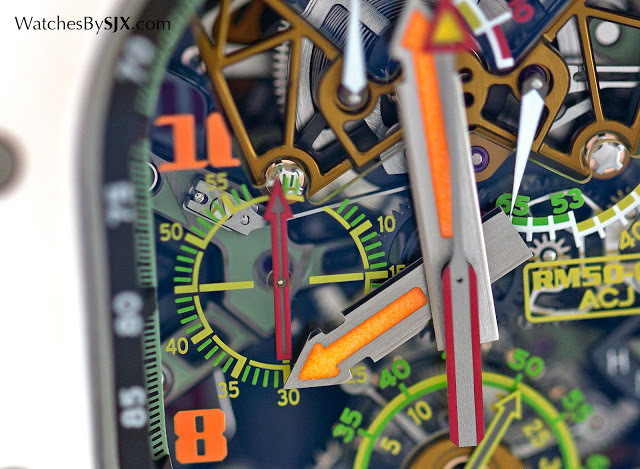 The dial itself is a clear sapphire disc, with orange, green, yellow and red markings. 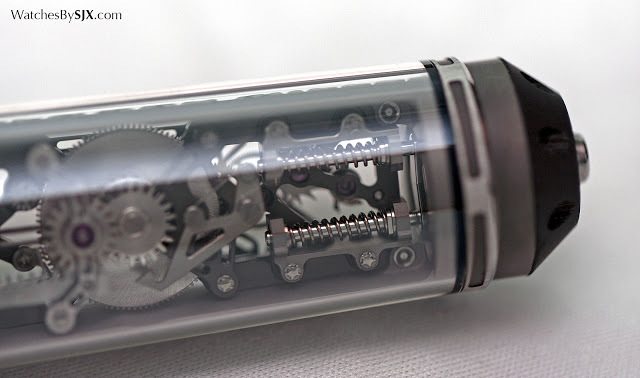 This reveals the movement, which has been skeletonised to show off its gears and levers. Several of the skeletonised bridges on the front and back have an unusual dark bronze colour, the result of a coating normally used to protect aircraft engine parts from corrosion. Most of the bridges in the movement, as well as the base plate, are made of titanium. 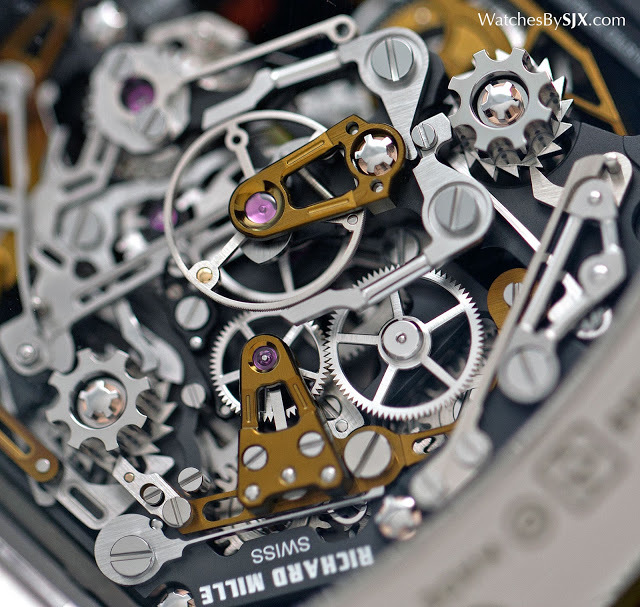 Hand-wound, with both a split-seconds chronograph and tourbillon, the movement inside is the most complicated used by Richard Mille, having also been found in other top of the line models. 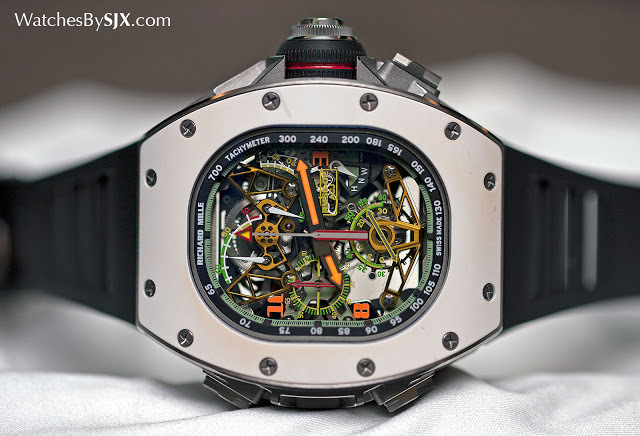 It is made by Renaud & Papi, the complications specialist owned by Audemars Piguet. 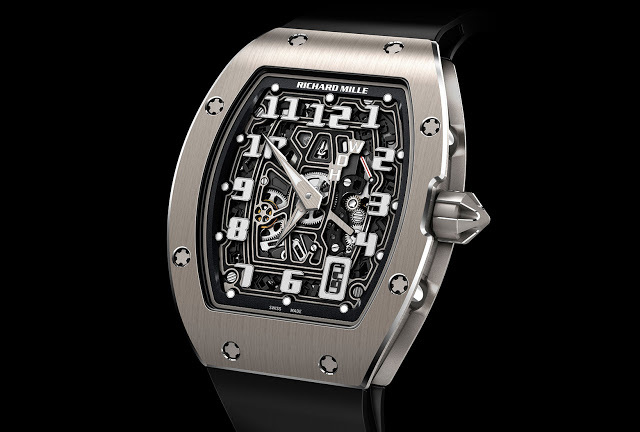 Measuring 42.7 mm in diameter and 50.1 mm long, as well as being 16.5 mm high, the RM 50-02 is one of Richard Mille’s largest watches. 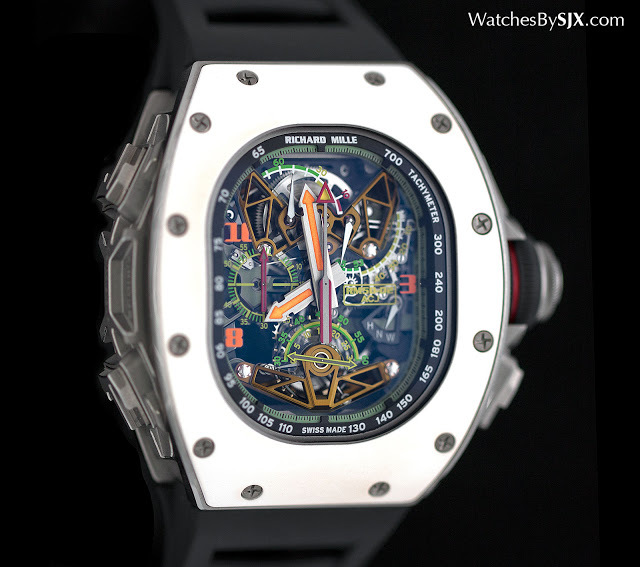 On the wrist it is large and eye-catching, a quality synonymous with Richard Mille. A mid-sized Airbus corporate jet costs about US$100 million, while the RM 50-02 ACJ is a paltry SFr1 million. It is limited to 30 pieces. The last of the 2016 collection is the RMS05 fountain pen. Made of titanium and carbon composite, the RMS05 is a safety pen, with the nib safely tucked inside the barrel. 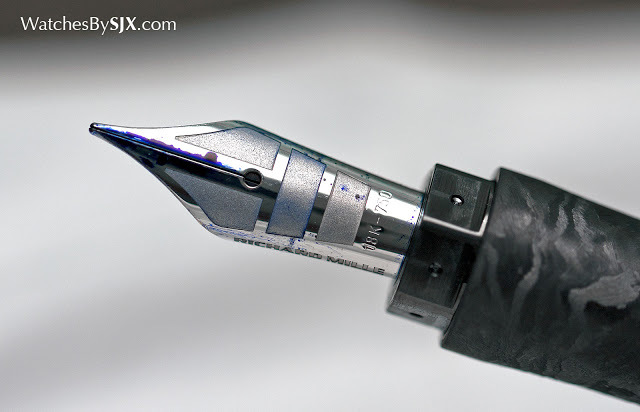 After unlocking the mechanism, a push button at the end of the barrel activates the mechanism that pushes the nib out. 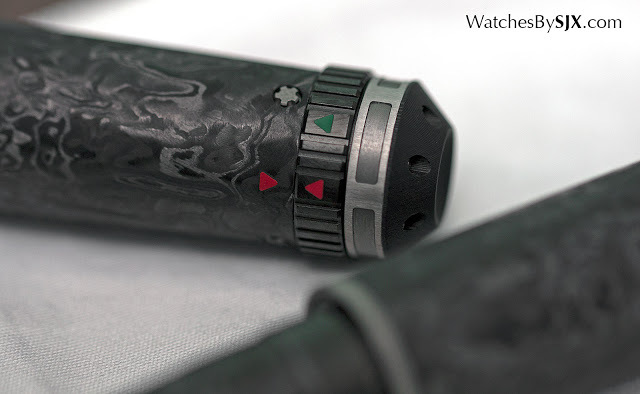 Putting the cap back on the barrel reverses the motion, and the nib retracts back into the barrel. The mechanism is tiny and contained at the end of the pen barrel. It is powered by a small mainspring that drives a small set of gears, with its motion regulated by an escapement. 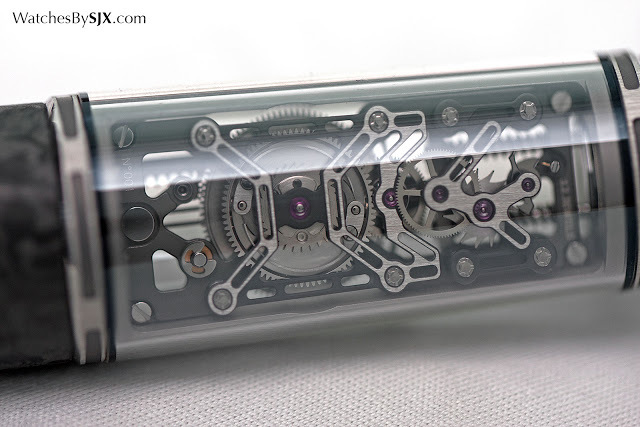 All the bridges of the mechanism are titanium, and it has 12 jewels. 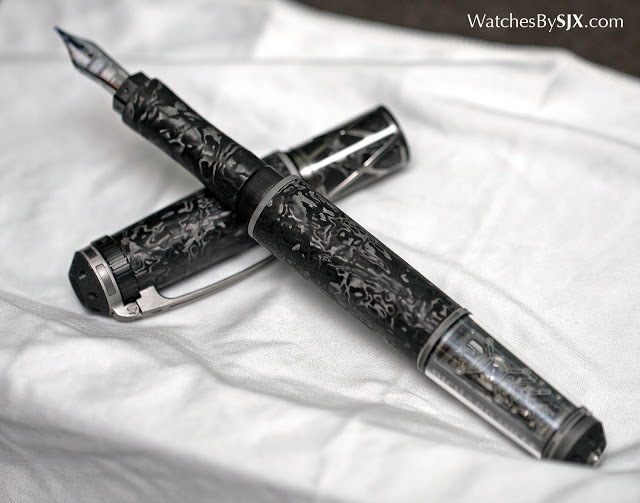 The mechanical fountain pen is a limited edition of 20 pieces with a price of SFr98,000.